Malaysia’s general election effectively created a two-party system but the direction that UMNO takes may push parties that have splintered from the BN closer to Pakatan, says Penang Institute’s Ooi Kee Beng. PENANG: The push for Malaysia to effectively become a two-party system has suddenly succeeded. However, just like a jammed door suddenly coming undone, the person pushing has also been sent flying into the room. The almighty Barisan Nasional (BN) coalition, formed to secure victory in the 1974 election following the scare of 1969, had used various means short of banning elections to neutralise all challenges to its hold on power. Over ten general elections, it stood invincible. But the battering ram of the opposition coalition in the country’s 14th general election held on May 9 this year proved too hard and too focused to repel, and the BN door cracked open. The triumph of Pakatan Harapan, led by past and now present Prime Minister Dr Mahathir Mohamad, was a decisive one. In fact, it was so decisive that the BN immediately began falling apart. Several member parties in Sabah left, and were soon followed by several more in Sarawak as well. On the peninsula, the latest news is that Parti Gerakan Rakyat is throwing in the towel as well. The backbone of the BN has always been the United Malays National Organisation (UMNO), but despite its dominance, the demographics of the country are such that its race-based structure never really gifted it with enough voter support to run the country on its own. In the recent election, it ended up with 53 members of parliament after one resignation, and if BN continues to disintegrate, then the major opposition force in parliament will not be BN, but UMNO, with its 53 MPs. The opposition MPs in fact will be a disparate lot. Even where UMNO is concerned, the sign on the wall points to a continued weakening of this once formidable party. More of its MPs are expected to jump ship soon. But even if they do not, the coming five years will be tough ones. The 53 MPs may seem a respectable size, but that number must be considered a snapshot taken as the party fell, thus representing past strength more than reflecting stable present support. Thus, all things being equal, we should expect UMNO to do much worse than in the 15th general election than it did in 2018, by virtue of the pure momentum of its fall. Since the fall also saw its safety net — the BN — tear apart, this projection is all the more certain. Khairy Jamaluddin, until recently the head of UMNO’s powerful youth wing and the country’s Minister of Youth and Sports, in being the first to declare the need for party reforms to the extent of making UMNO a multiracial part, and in being bold in announcing that he will be a candidate for party president in the party election being concluded this coming Sunday (Jun 30), is clearly styling himself as the future hope of the party. This stance seems tactically necessary and promising since his main opponents will be the former Deputy Prime Minister and UMNO’s acting president Zahid Hamidi, and party veteran Tengku Razaleigh Hamzah. In a contest against these three, the remaining two candidates—Mohamed Iqbal Maricair and Mohd Yusof Musa@Jamaluddin—are not likely to put up much of a challenge. Given the conservative spirit of the party elections so far, it would seem that Zahid is the best bet to win. Tengku Razaleigh is seen by most to be a spent force, and has been so for a long time. Should the party decide to play safe and avoid serious changes to its ideology, its personnel and its structure, then the falling dynamics of the party will persist over the coming five years to culminate in another rude shock for the party in the country’s 15th general election. Radical times need radical acts, but at the moment, UMNO, perhaps shielded by the fact that it retained a substantive number of seats in the election, is tempted to ignore the reality that its strong hold on power was possible only as long as it inhabited the BN body and was turbo-charged by it. Without the BN platform, the need for UMNO to undergo radical changes should be obvious — but perhaps not to the rank and file yet. If party elections were held a bit further down the road, instead of just seven weeks after the election, then the new reality would have time to sink in down to the grassroots. As it is now, many will seek comfort in the old and prefer the familiar to the novel. 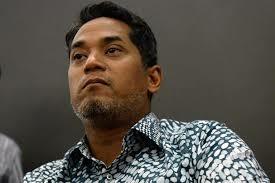 Khairy may therefore be a little too far ahead of his time, and he may have to wait for his fellows to catch up. For UMNO, this will mean that precious opportunities to restrategise will be wasted. For Malaysia and for the establishment of a stable two-party system, a failure by UMNO to transform itself into a party that has a future will also be disheartening for all other parties that are now not members of the Pakatan Harapan. They may not wait around for a new coalition to form. Instead, they may soon feel tempted to join the new ruling coalition, either as parties or as individuals. When that happens, the new governing structure would reign supreme, becoming a new one-coalition system in effect, and threaten to invalidate the two-party system that Malaysia for the moment appears to have. « A Malaysian Spring for its Intelligentsia?